Funko Disney Afternoon Mystery Minis gives many beloved cartoon charters a miniature vinyl transformation. The extensive set also consists of exclusive figures at GameStop, Hot Topic and Toys R Us, making for a fun and challenging collecting adventure. Even though a few subjects match their bigger Pop! Disney figures, Funko Disney Afternoon Mystery Minis offers several fresh editions to the lineup. Among these are the Rescue Rangers' Chip, Dale, and Gadget Hackwrench, plus Baloo and Kit Cloudkicker from TaleSpin. Issued in a blind-box format to help disguise each figure until unwrapped, you might be inclined to call for reinforcements (or a magic spell!) to discover your favorite character. Making the hunt more involved, several retail outlets each carry at least three exclusive options. The boys from DuckTales—Dewy, Huey, Louie—in their Junior Woodchuck attire are issued through GameStop, while the Magica De Spell, Negatron, and Scrooge McDuck swimming (in coins?!) figures can be found at Hot Topic locations. Toys R Us features Negaduck, along with TaleSpin's Louie and Shere Khan. 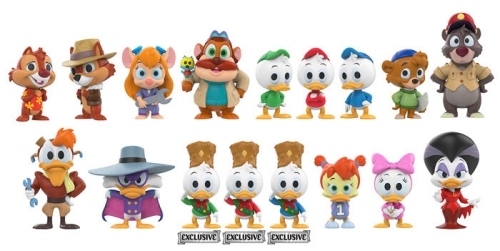 Including known exclusives, there are at least two dozen Funko Disney Afternoon Mystery Minis to discover. Because one case holds just 12 boxes, collectors will need more than one to complete the entire set, and will also need to visit each retailer for the exclusives. Known odds for Funko Disney Afternoon Mystery Minis are listed below. 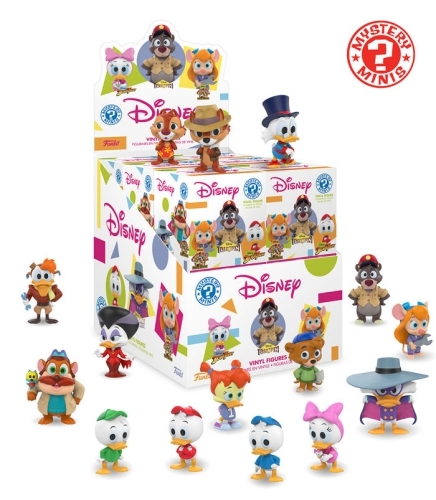 Order Disney Afternoon Mystery Minis Boxes on Entertainment Earth. Funko Mystery Minis Disney Afternoon Cartoons & Warner Bros Lot! FREE SHIPPING!! Enjoy our related Pop! guides for more Disney figure options.